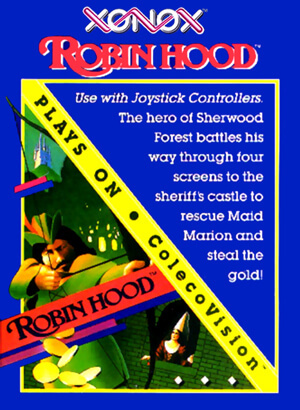 Robin Hood is an action game where you need to rescue Maid Marian who is being held by the Sheriff of Nottingham in a castle (and while you're at it, steal some gold to give to the poor)! 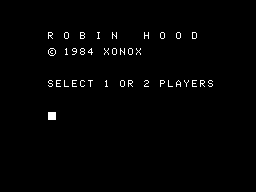 Gameplay takes place on several different screens which have different objectives. 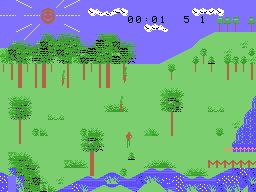 First you will need to make your way through Sherwood Forest; numerous henchman are hiding here, so use your arrows to shoot them. 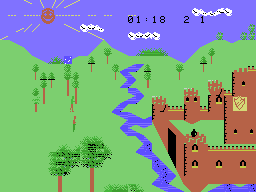 Surviving the forest, the next section takes place outside of the castle; naturally, numerous henchman guard the castle gate. While dodging incoming arrows, you need to shoot enough of the henchman to cause the gate to open. Once it opens, you can enter the castle for the final scene. Inside the castle you will be able to find Maid Marian behind one of the many doors, and gold behind another. The rest of the doors have henchman hiding behind them, but if you can find the Maid Marian or the gold then you win this round and the game repeats at a tougher skill level.